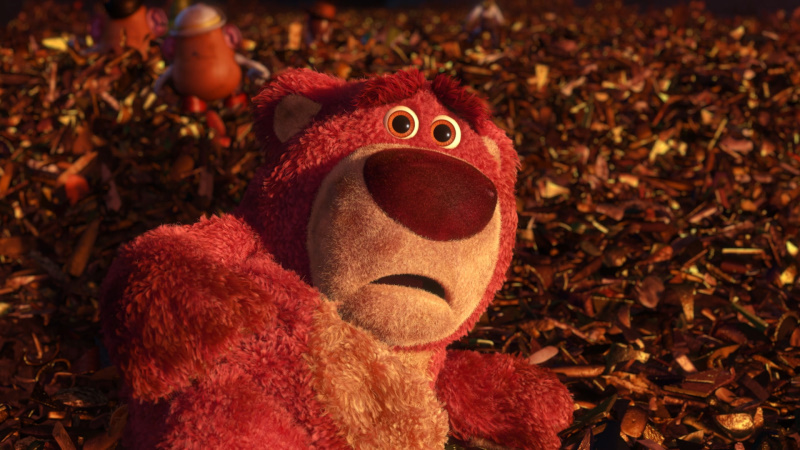 • Ken's Dating Tips (1:30), Lotso Commercials (:30) Making Of (1:28), "Dancing with the Stars" at Pixar (2;21) etc. 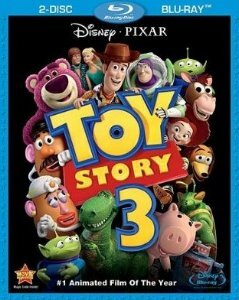 Description: The creative minds behind Disney•Pixar's groundbreaking animated blockbusters invites you back inside the Toys' delightful world for a heartwarming and hilarious Hi-Definition movie experience you'll never forget. 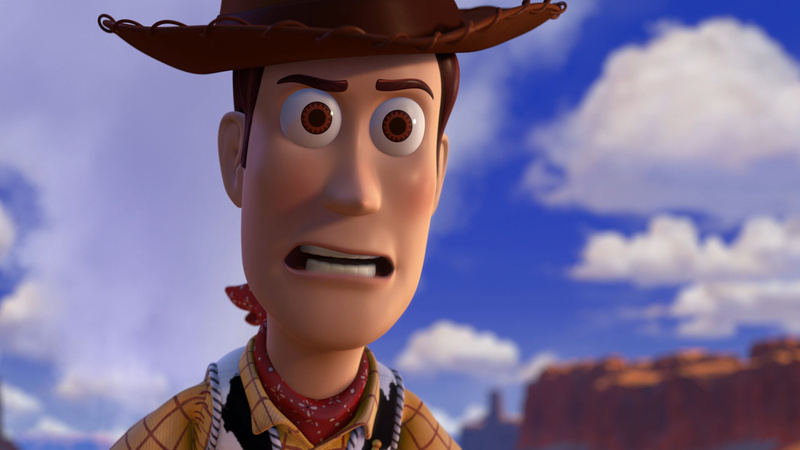 All the original voice talent returns (including Tom Hanks and Tim Allen) plus new talent including Michael Keaton as Ken and Ned Beatty as Lots-O'-Huggin' Bear. 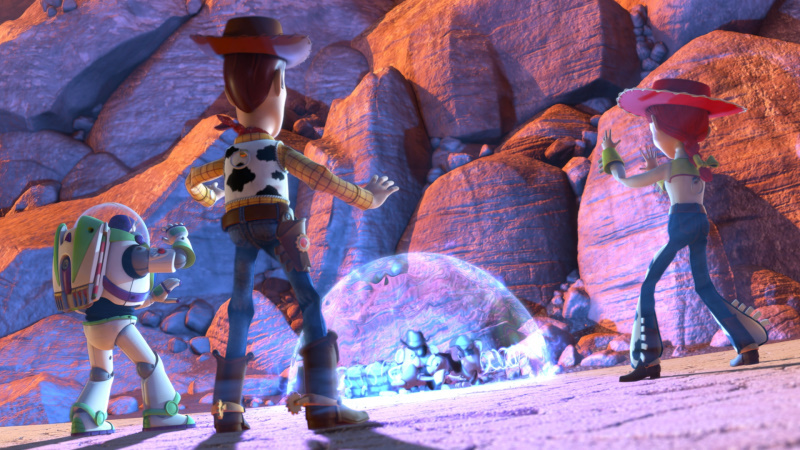 It's "the biggest, best, most exciting Toy Story of them all," raves Access Hollywood. 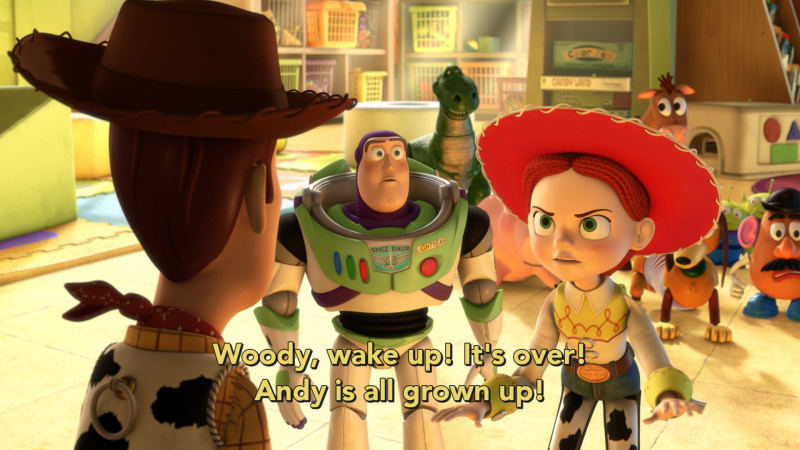 As Andy gets ready to leave for college, Woody, Buzz, Jessie and the rest of the gang wonder if this is the end of the line. 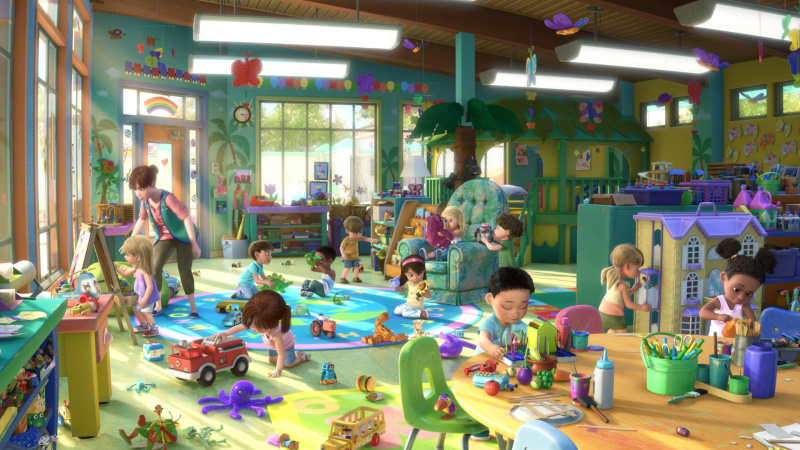 But, when a mix up lands them in the Sunnyside Day Care Center where they meet 14 new toys, they soon discover that a wild new adventure is just beginning! 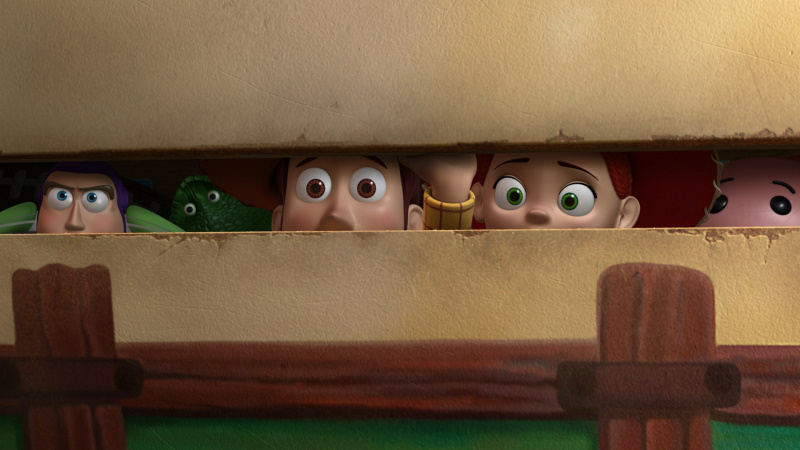 Take an amazing journey with some of the most beloved characters in movie history and discover what being a friend is truly all about. "It's everything a movie should be: hilarious, touching, exciting and clever," says USA Today. 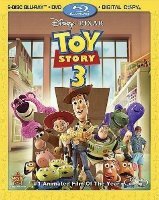 Buzzing with hours of exclusive bonus features, including an interactive trivia game and the Pixar short film Day and Night, Toy Story 3 goes to infinity and beyond on Blu-ray Hi-Def! 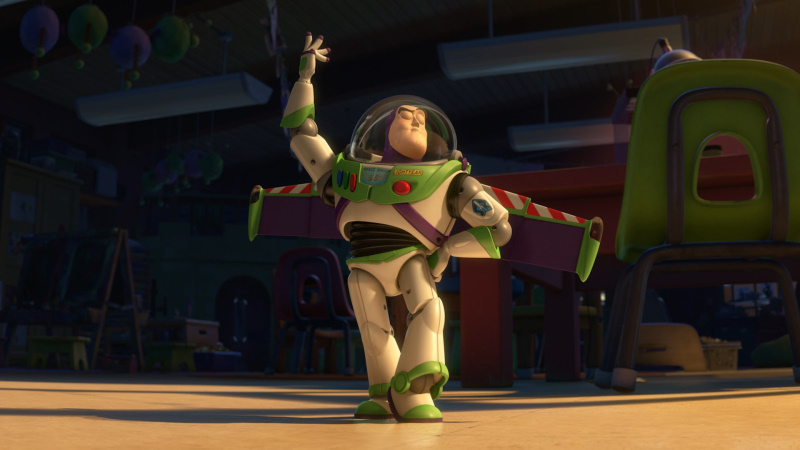 And how many real kids who have grown up with Buzz Lightyear and Sheriff Woody have unspooled their own improvised movies on the rec room floor? Perhaps no series of movies has so brilliantly grasped the emotional logic that binds the innate creativity of children at play to the machinery of mass entertainment. Each one feeds, and colonizes, the other. 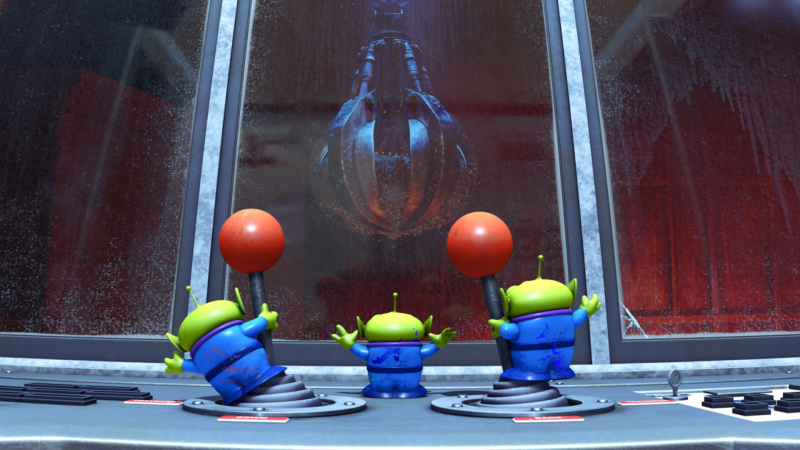 And perhaps only Pixar, a company Utopian in its faith in technological progress, artisanal in its devotion to quality and nearly unbeatable in its marketing savvy, could have engineered a sweeping capitalist narrative of such grandeur and charm as the “Toy Story” features. 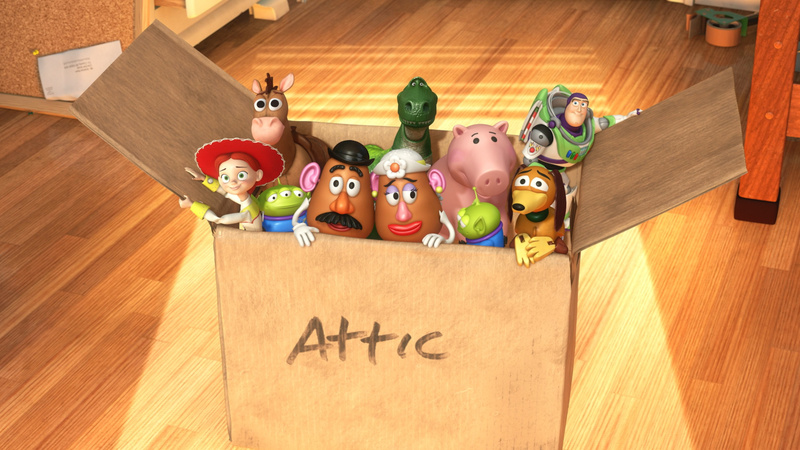 “Toy Story 3” is as sweet, as touching, as humane a movie as you are likely to see this summer, and yet it is all about doodads stamped and molded out of plastic and polyester. Therein lies its genius, and its uncanny authenticity. A tale that captured the romance and pathos of the consumer economy, the sorrows and pleasures that dwell at the heart of our materialist way of life, could only be told from the standpoint of the commodities themselves, those accretions of synthetic substance and alienated labor we somehow endow with souls. Cars, appliances, laptops, iPads: we love them, and we profess that love daily. 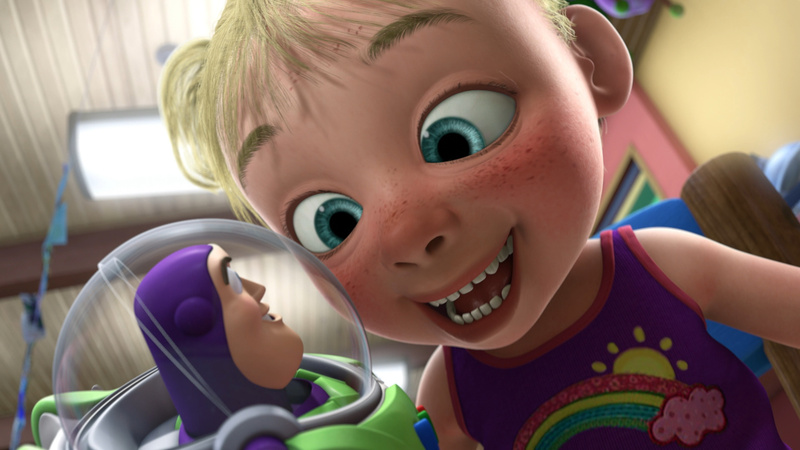 Its purest, most innocent expression — but also its most vulnerable and perishable — is the attachment formed between children and the toys we buy them. “I want that!” “That’s mine!” Slogans of acquisitive selfishness, to be sure, but also articulations of desire and loyalty. 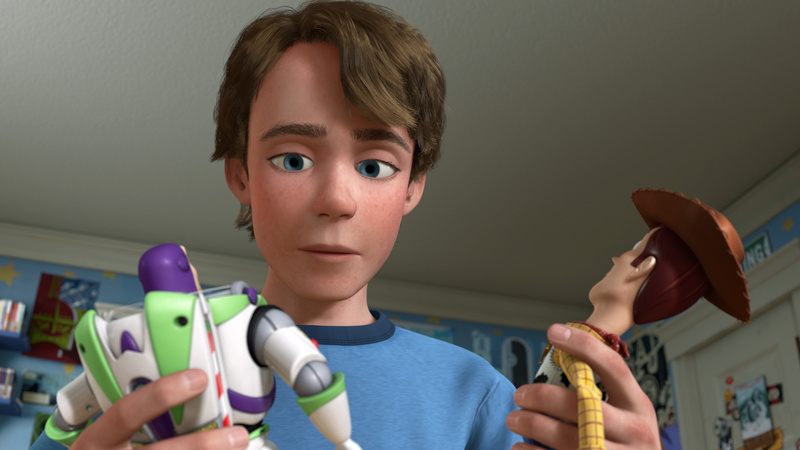 The first “Toy Story” acknowledged this bond, and “Toy Story 2” turned it into a source of startlingly deep emotion. Firstly, I have, and are reviewing, the 2 Blu-ray disc release - there is also a 4-disc edition (same 1080P feature transfer and second Blu-ray supplements disc) which also includes a DVD of the film and a Digital Copy. It costs about $5 more. 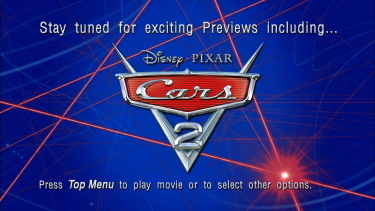 Almost 7-minutes of, skippable, Previews (A Christmas Carol and Cars 2 included) which seem excessive to me but anyway I wouldn't let it ruin this magnificent presentation. We can pretty much parrot our comments from Toy Story + Toy Story 2 Blu-rays in regards to image. The benefit to the higher resolution appears to be in the dimensionality - even without-3D + glasses. As we have said in the past - digital animation is that it is essentially flawless - it should have none of the common deficiencies that we can find when transferring live-action film to high-definition digital - things like edge-enhancement or noise removal manipulation don't exist. Haze and blurriness are intentional effects to create the perception of motion. Out-of-focus experiences are simply created to make the true focal object more primary to our vision. 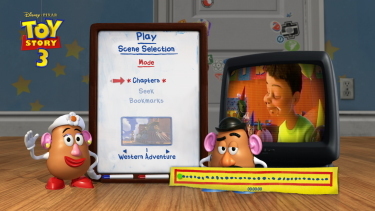 By rendering digital animation to Blu-ray we should be able to obtain the highest accuracy of the original. This is a prime example and I'll wager it may actually look better than theatrical - dependant on your individual system. 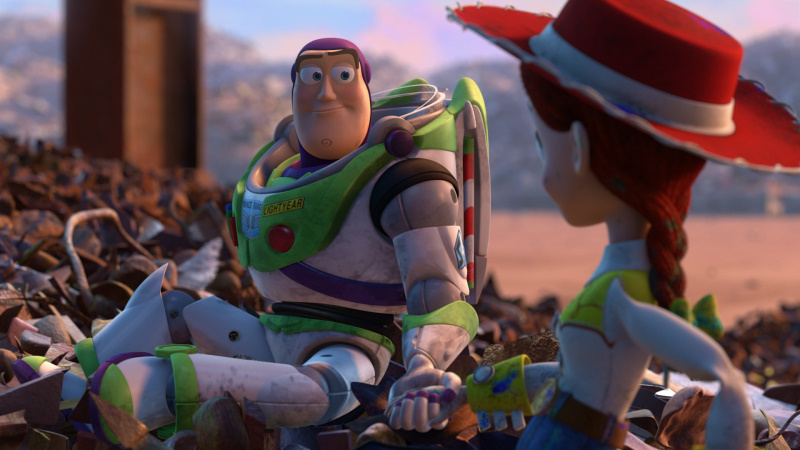 There are a lot of varied visuals in Toy Story 3 from the western motive start with open plain vistas to the flame and crunched metal dump-site conclusion. It is close to the absolute best I have ever seen the medium look on my plasma television. It's hard to turn your eyes away once it starts. I sincerely doubt it can ever look any better. While some can debate the hypnotic video being 'reference' - surely the audio with a crystal clearly and sharp DTS-HD Master 7.1 at at resoundingly dynamic 5506 kbps must be in the running for best lossless track of the year. 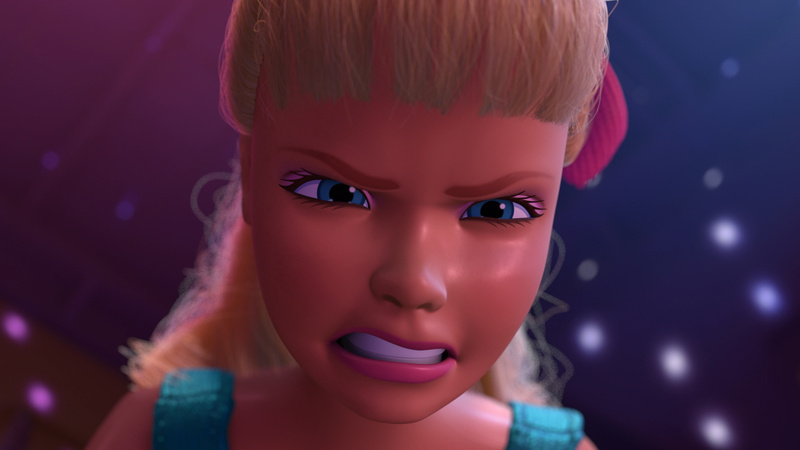 Aside from the voice characterizations every sound in the film is an effect noise - and done with the expected extreme levels of Disney proficiency. Separations are coming out of everywhere - especially in the action-infused opening and the later stages of escape. Luckily, not a lot of the nasal crooning of Newman but his score runs aside the film sounding brilliant. This track is absolutely perfect. 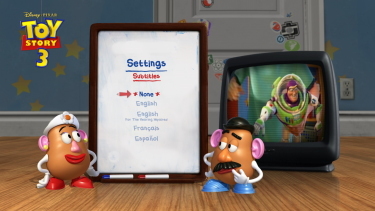 There is an untested DTS-HD Master 5.1-ES at 3998 kbps, a 'Descriptive Video' track, and standard Dolby 5.1 French and Spanish DUBs plus subtitle options and my Momitsu has identified it as being a region FREE disc playable on Blu-ray machines worldwide. 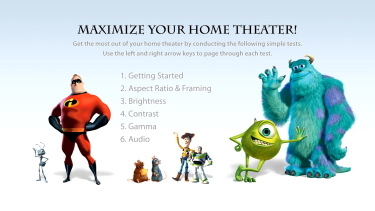 Blu-ray disc one - along with the feature film has 18:11 worth of video extras (not counting tutorials, excellent Maximize your Home Theater feature, and Screen Saver mode option). 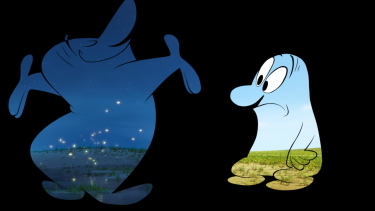 Day & Night (which I also saw before the theatrical film) is a unique and creative 6-minute short with the animation through the bodies of two characters. 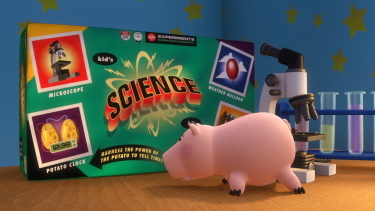 We also get 5-minutes of Buzz Lightyear Mission Logs: The Science of Adventure (in conjunction with NASA) and 6-minutes of Toys! - A look at all the toys from updating classic characters to developing the Sunnyside Daycare and Bonnie's Room toys. Okay, there is a second Blu-ray disc which is incredibly deep (Bonuses under headings 'Family Play', 'Films Fans', 'Games and Activities', + 'Publicity') - this includes the film again in 1080P (22 Gig feature with English - SDH, English, Chinese (traditional and simplified), French, Korean, Portuguese, Spanish, Thai subtitle options for the extras involved directly with the film) with both the Beyond the Toybox - an alternate commentary featuring leads from the story, tech team etc. and the Cine-Explore with Director Lee Unkrich and Producer Darla Anderson - the film with storyboards etc. picture-in-picture. So it's the entire film again from a technical production standpoint - quite the education. 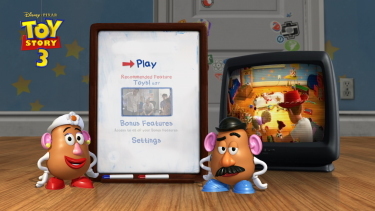 There is an, untested, Interactive Game: Toy Story Trivia Dash, Bonnie's Playtime -a roundtable discussion with the Lee Unkrich and the story artists who brought the "Bonnie's Playtime" scene to life , The Gang's All Here (10:46), Roundin' Up a Western Opening - development process and scene analysis of "Western Opening" in its various iterations through the story process (5:42), Goodbye Andy - an exploration of character design, acting and animation in the scene "Andy's Goodbye" (8:02), The Accidental Toymakers of Pixar - meet the makers of the original Buzz Lightyear and watch how the newest version of Buzz - the Ultimate Buzz is constructed (3:56), A Toy's Eye View (5:19), Life of a Shot - overview of artist contribution to each step of the production pipeline on a select group of shots from the western opening of Toy Story 3 (6:57), Making of Day and Night (2:00), Paths to Pixar (4:38), Studio Stories shorts including Where's Gordon - 2:16, Cereal Bar - 1:36, Clean Start - 3:05 plus an Epilogue - Stand-alone 1.33 version of the Epilogue (4:23) and some humorous faux publicity like Ken's Dating Tips (1:30), Lotso Commercials (:30 X 2 - one in Japanese) Making of Lotso Commercials (1:28), "Dancing with the Stars" at Pixar (2:21) and more, plus a Poster Gallery and the disc has BD-Live functionality. Exhausting to say the least - no stone appears left unturned. Just like the other recent Disney Blu-rays this will remember where you last left off and ask if you would like to continue from that point or start from the beginning. 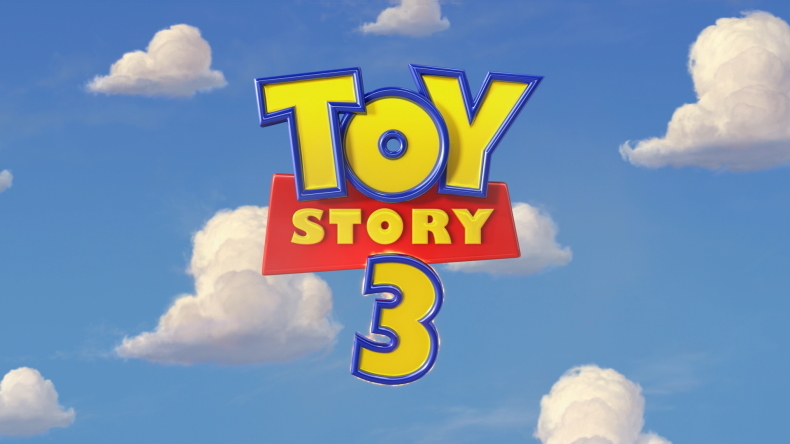 I took my two boys to see Toy Story 3 in the theater (3-D) and it was one of the best experiences of the year for them. Frankly, bitter critic Armond White can shove it. The Blu-ray is perfection - looking and sounding pristine for your home theater - there isn't a pixel out of place. You don't have to be a child to get into this - as a matter of fact - most of the audience in the theater showing I attended where over 20-years of age... with NO kids in tow. 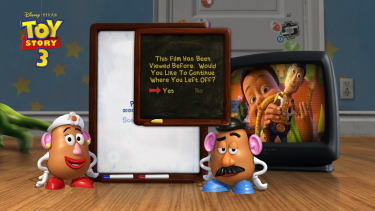 Last time I had friends over, kids were around and I threw in Toy Story as a demo. The adults could not keep their eyes off the screen. Wait till they see this. This will be a part of my digital library as long as I am alive. Our highest recommendation. About the Reviewer: Hello, fellow Beavers! I have been interested in film since I viewed a Chaplin festival on PBS when I was around 9 years old. I credit DVD with expanding my horizons to fill an almost ravenous desire to seek out new film experiences. I currently own approximately 9500 DVDs and have reviewed over 3500 myself. I appreciate my discussion Listserv for furthering my film education and inspiring me to continue running DVDBeaver. Plus a healthy thanks to those who donate and use our Amazon links. Although I never wanted to become one of those guys who focused 'too much' on image and sound quality - I find HD is swiftly pushing me in that direction. So be it, but film will always be my first love and I list my favorites on the old YMdb site now accessible HERE.